Raleigh, North Carolina, US, May 2013. By Barb Baranski, Sarah Brooks, Sandy Carlson, Julie Cox, David Machles and Mer Stafford; Photos courtesy of Kadampa Center. 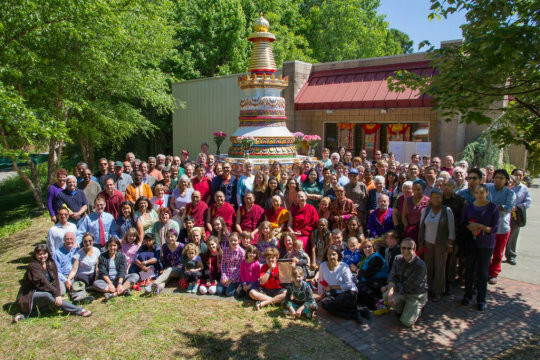 The idea for Kadampa Center in Raleigh, North Carolina, US, took shape in 1990, and in October 1991, Don Brown officially founded the center. Our first home was in the basement of an office condominium, where we remained until we moved in 2007 to our current location, a former aquarium store in need of renovation. The community tore out walls, hung drywall, laid flooring, painted, cleaned and ran wires, finishing just in time for one of Ven. Robina Courtin’s annual visits. It was exciting to have the space open for such a large gathering! We have had many great visiting teachers, including several visits by Lama Zopa Rinpoche, who encouraged us to first obtain a Kalachakra statue and then to build our Kadampa stupa. Our precious resident teacher, Geshe Gelek Chodha, has been with us for over 14 years, and we are pleased that several members of our community have become ordained, making a larger commitment to their practice. Our programs continue to expand to fill the requests of our rapidly growing membership. Each day starts with silent meditation, and most evenings include one or more programs. On Sundays, like many churches, we offer the same teachings twice along with our popular children’s program that has age-based group classes and babysitting in the nursery. We offer a wide range of classes, from basic introductions to Buddhism and meditation to instructions on bodhisattva and tantric vows. Our longest ongoing class is studying the Lamrim Chenmo with Geshe Gelek. We began teaching Discovering Buddhism in 2002, and haven’t stopped since – starting over every two years. We’ve also started offering classes like “Food for Thought,” exploring mindfulness when eating. On the practice side, our monthly calendar typically includes Tara practice, Medicine Buddha and Guru pujas, and special practices on holy days. Weekend retreats both at the center and off-site also happen periodically, and we had our first family Dharma camp this summer. We also provide or sponsor special ritual services such as statue consecrations with mantra rolling, pet blessings and animal liberations.